Thomas Malthus first published his famous essay in 1798, in a nineteen chapter book titled An Essay on the Principle of Population. Chapter I began with Malthus stating the question he wanted address in his essay. Toward the end of the chapter, he gives his most well-known point: that a matching increase in necessary food supply will at some point not be able to keep up with continuing population growth. “[p.14] Through the animal and vegetable kingdoms, nature has scattered the seeds [p.15] of life abroad with the most profuse and liberal hand. She has been comparatively sparing in the room, and the nourishment necessary to rear them. The germs of existence contained in this spot of earth, with ample food, and ample room to expand in, would fill millions of worlds in the course of a few thousand years. Necessity, that imperious all pervading law of nature, restrains them within the prescribed bounds. The race of plants and the race of animals shrink under this great restrictive law. And the race of man cannot, by any efforts of reason, escape from it. Among plants and animals its effects are waste of seed, sickness, and premature death. Among mankind, misery and vice. The former, misery, is an absolutely necessary consequence of it. Vice is a highly probable consequence, and we therefore see it [p.16] abundantly prevail; but it ought not, perhaps, to be called an absolutely necessary consequence. The ordeal of virtue is to resist all temptation to evil. This natural inequality of the two powers of population, and of production in the earth, and that great law of our nature which must constantly keep their effects equal, form the great difficulty that to me appears insurmountable in the way to the perfectibility of society. All other arguments are of slight and subordinate consideration in comparison of this. I see no way by which man can escape from the weight of this law which pervades all animated nature. No fancied equality, no agrarian regulations in their utmost extent, could remove the pressure of it even for a single century. And it appears, therefore, to be decisive against the possible existence of [p.17] a society, all the members of which, should live in ease, happiness, and comparative leisure; and feel no anxiety about providing the means of subsistence for themselves and families. 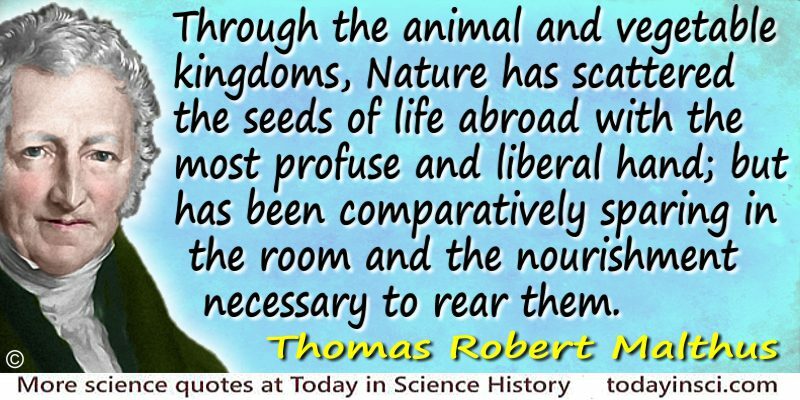 Science Quotes by Thomas Robert Malthus. 13 Feb - short biography, births, deaths and events on date of Malthus's birth.